The Cougars cheer in celebration as they rallied for the lead. The Canterbury Cougars know a thing or two about dealing with adversity. The defending Class 3A state champions overcame some tough obstacles in winning the state title last season. 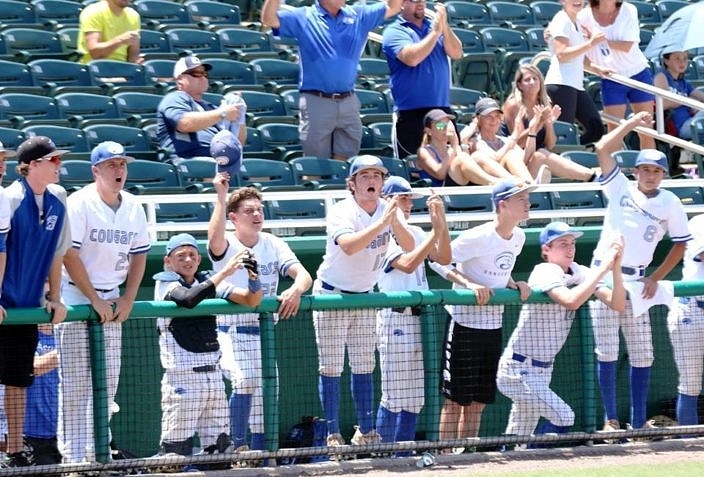 So when the Cougars found themselves in a tough situation early on in their 3A state semifinal against Bishop McLaughlin on Friday afternoon, instead of panicking, heroes stepped up to take the lead. Trailing by a run and losing their ace starting pitcher to a neck strain after one inning, Canterbury rallied behind reliever Tyler Shuck and stormed back for a 7-4 victory. 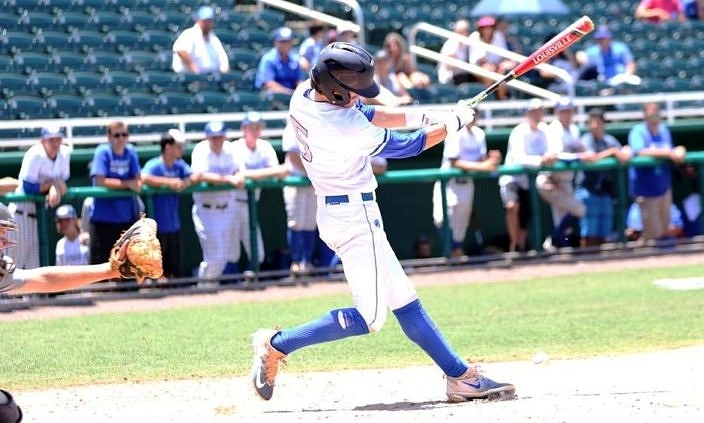 Canterbury (6-5) will take on University Christian in Saturday afternoon’s 3A state championship at Hammond Stadium in Fort Myers. The Christians advanced following a 6-0 win over Archbishop Carroll in Friday’s other semifinal. Although there were no plans for Tyler Shuck to even pitch during the state tournament, when ace Sam Keating left the game with injury he approached his coach and asked for the ball. The fact that Tyler Shuck all but demanded the chance to take over in relief came as little surprise to his teammates and coaches. Those closest to him know the type of player he is and what he is willing to do for his team. The Hurricanes grabbed the lead in the first inning to put immediate pressure on. Bryce Carroll was hit by a pitch, advanced around the bases on some pitches in the dirt and then scored when Dillon Morton sent an RBI single through the right side of the infield defense. Canterbury attempted to answer right back after Cooper Swanson led off the bottom of the first with an infield single, but McLaughlin turned a smooth 4-6-3 double play to quell the threat. But after Tyler Shuck gave them a burst of confidence, the Cougars collected themselves and got going in the bottom of the second. Catcher Giovanny Lorenzo sent a shot deep to left field for a stand-up double and then gave way to courtesy-runner Levi Shuck, who scored on an infield error to tie the game. Donovan Duvall kept it going with a base hit and Giovanni DiGiacomo drove in both Duvall and Alec Babb for a 3-1 advantage. DiGiacomo got it going again in the fourth as the Cougars tacked on two more runs. The center fielder lined a double deep to the left field corner, before again giving way to Levi Shuck. Cooper Weiss was next with a double to right field and a throwing error allowed both base runners to score. Bishop McLaughlin got the bats going to pull within a run in the top of the fifth. Bryce Carroll blasted a double to left, Morton walked and Paul Coumoulos reached on an error that allowed Carroll to cross the plate. Following a walk to Zack Bergland, Shafer Magee delivered a liner to left field that drove in two base runners to make it a 5-4 ball game. Canterbury struck right back in the bottom of the fifth to extend the lead back to three runs. Danny Cunningham walked and advanced thanks to a sacrifice bunt from Julian Meyers anad Tyler shuck followed by lining an RBI single past the second baseman. Weiss then connected for a shot deep to left field for an RBI double. Bishop McLaughlin loaded the bases to threaten again with one out in the top of the sixth. 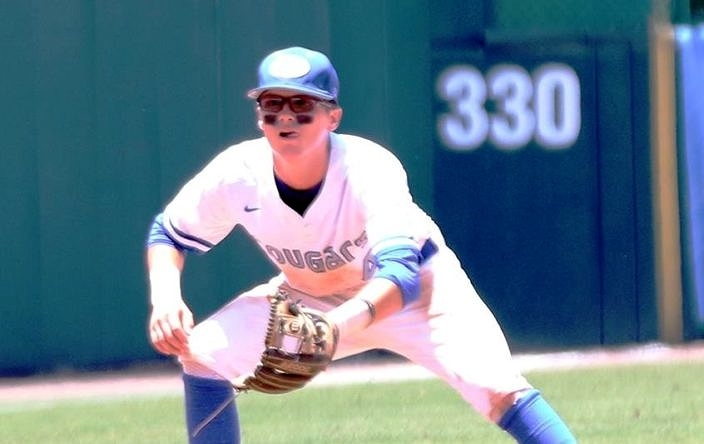 But A nice pickoff to erase a runner at first base recorded the second out, and a liner to left field was hauled in to end the threat and put the Cougars three outs away from the eventual victory. Canterbury manager Frank Turco discusses the team's pitching depth and how it helped in Friday's win. The Canterbury Cougars discuss the chance to defend their 3A state title.